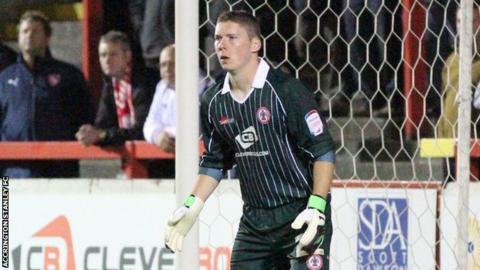 Accrington goalkeeper Andrew Dawber has agreed a new deal that will keep him at the club until the summer of 2015. The 18-year-old made his senior debut in a and featured in League Two for the first time as a sub against Plymouth Argyle in December. "I was excited as soon as the boss (Leam Richardson) mentioned it to me," Dawber told the club website. "It's a real vote of confidence to be given this contract." He cotinued: "I'd like to thank the gaffer and everyone on the staff who has contributed towards it. "It's quite important to know that I can purely concentrate on the football and not have to worry about new deals in the summer. "There are lads out there who don't have a contract and don't know their future, so obviously I'm very happy to have that bit of security." on Saturday, leaving Richardson's men three places and just two points above the relegation zone. The Stanley manager said the dismissal of midfielder Charlie Barnett after four minutes made life extremely difficult for his team, telling BBC Radio Lancashire: "When you come to a place like this, it's always going to be tough with 11 men. "To find yourself with 10 men and have 90-odd minutes to face them, it's going to be even tougher."